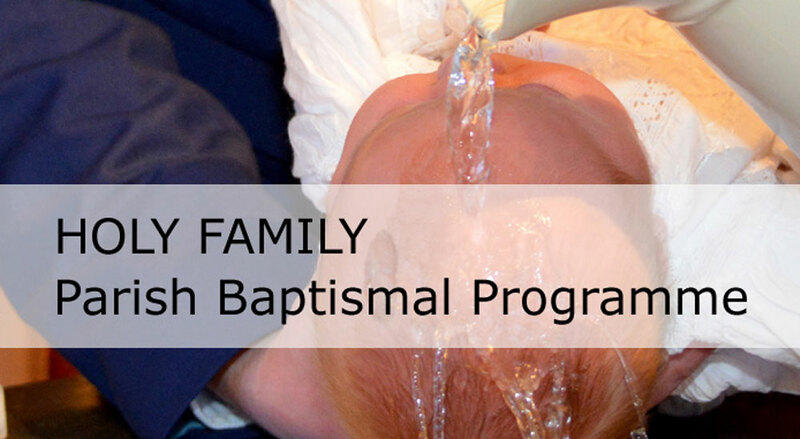 Many parishes in the city have a special Baptismal Programme to help the parents and family of the new baby to enrich their awareness of the beauty of this sacrament. We have now a team in Holy Family prepared to do the same. Henceforth those who want a child baptised come to the Parochial House where they will be given the date of the next meeting. At this meeting baptism cards are given out and we have our own custom- made slide show- which by the way, you can find below - explaining the significance of the sacrament, together with the responsibilities of the parents and godparents .The meeting also includes a welcome from myself, a prayer, a short talk, ,questions and answers and a cup of tea. Every three months we have a special weekend Mass to which the parents and god parents are invited. But the programme begins after the mother discovers she is pregnant. Then after Mass I offer a maternity blessing to the mother and baby’s father, in the sacristy. The mother will then be given a little prayer which I include below. Just for a little while, O Lord, you have placed my baby beneath my heart, snuggled within the depth of my body and my being. When I drift off into my dreams I feel those tiny feet bracing against me, wriggling in anticipation, getting ready for the great escape. Thank you for this precious gift and these months of closeness when I wonder at life’s mystery. Keep us safe. then walk and run to escape again, even to the furthest corners of the world. O Lord, I will hold these memories dear and - like You - I‘ll be waiting, always, just in case I’m needed.